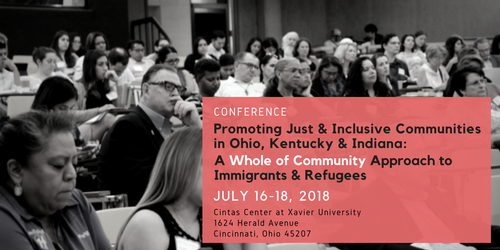 Join scholars, researchers, community organizers, service providers, local officials, leaders of faith communities, immigrant advocates, and others for a three-day event on how diverse groups in Ohio, Kentucky, and Indiana are working together to meet the needs of immigrant communities. This event will examine “whole of community” responses to welcoming, integrating, and protecting immigrants, lift up models and best practices, and provide opportunities for further community-focused collaborations. It will also help participants identify and bolster their legal support, research, and capacity needs in addressing these issues. The conference schedule includes: optional site visits on July 16; and plenary panels and workshops on July 17 and 18. The agenda and list of speakers below will continue to be updated. The conference fee of $50 includes lunch and refreshments throughout the event. To register, visit https://ohkyincommunities.eventbee.com. Discounts and fee waivers are available to registrants/organizations indicating financial need. To request a discount or fee waiver, please contact cms@cmsny.org.